Do you have something to say but sometimes struggle to express yourself in writing? Do you have something to write but are unsure how best to approach it? Do you sometimes wonder how to communicate clearly and effectively in writing? Would you welcome some help in writing that urgent piece? After all, you only have one pair of hands and perhaps spelling and grammar are not your strongest points. ould you use the services of a writer who knows how to bring clarity to what you write? Polish it and make it sparkle? Writing is my trade and, in all modesty, I am an expert at what I do. Take advantage of my extensive professional writing experience. native speakers, we proofread, edit and even write copy in English should you need it – professionally, reliably and discreetly. If you plan to make your academic or promotional text fit for going international, then textsandtranslations is just the right service provider for you. To bring clarity to your writing, contact me for a no-obligation quotation. Bayer-Hohenwarter, Gerrit (2012): Translatorische Kreativität. Definition – Messung – Entwicklung. (Translationswissenschaft 8). Tübingen: Narr. What is translational creativity? How can we measure it? Do translators translate more creatively as their translation competence increases? These are the central issues addressed by this empirical study using psycholinguistic methods. The data at the base of the study are the target texts and translation processes of twelve students who took part in translation experiments each semester during their bachelor programme. These data were compared with those of ten professional translators who were given the same translation assignments as the student translators. Göpferich, Susanne; Bayer-Hohenwarter, Gerrit; Prassl, Friederike; Stadlober Johanna (2011): “Exploring translation competence acquisition: Criteria of analysis put to the test.” O’Brien, Sharon (Hrsg. ): Cognitive Explorations of Translation. (Continuum Studies in Translation). New York/London: Continuum. 57-85. Bayer-Hohenwarter (2011): Die Entwicklung translatorischer Kreativität. [The development of translational creativity.] Dissertation. Graz: ITAT. Bayer-Hohenwarter, Gerrit (2011): “’Creative shifts’ as a means of measuring and promoting translational creativity.” Meta 56/3, 663-692. Bayer-Hohenwarter (2011): „Kreativität in populärwissenschaftlichen und instruktiven Texten im Vergleich: Kein Raum für Kreativität beim Übersetzen von instruktiven Texten?“ trans-kom 4/1, 49-75. Bayer-Hohenwarter, Gerrit (2010): “Comparing translational creativity scores of students and professionals: flexible problem-solving and/or fluent routine behaviour?” Göpferich, Susanne; Alves, Fabio; Mees, Inger (Hrsg. ): New Approaches in Translation Process Research. (Copenhagen Studies in Language 39). Copenhagen: Samfundslitteratur. 83-111. Bayer-Hohenwarter, Gerrit; Göpferich, Susanne; Prassl, Friederike (2010): „TransComp: der Entwicklung translatorischer Kompetenz auf der Spur.“ Universitas Mitteilungsblatt 2 (2010), 6-10. Bayer-Hohenwarter, Gerrit (2009a): “Methodological reflections on the experimental design of time-pressure studies.” Across Languages and Cultures 10/2, 193-206. 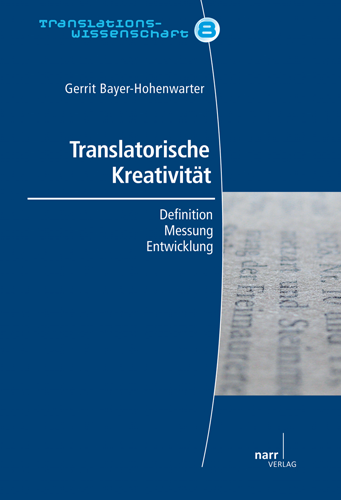 Bayer-Hohenwarter, Gerrit (2009b): “Translational creativity: how to measure the unmeasurable.” Göpferich, Susanne; Jakobsen, Arnt Lykke; Mees Inger (Hrsg. ): Behind the Mind: Methods, Models and Results in Translation Process Research. (Copenhagen Studies in Language 37). Copenhagen: Samfundslitteratur. 39-59. Bayer-Hohenwarter, Gerrit (2008): „Alles nur eine Frage der Zeit? – Methodologische Überlegungen zu Zeit(druck) und Translation.“ JosTrans 9, 108-131.